This buckle is very interesting in that it has 4 rivet holes (1 remaining) that apparently attached it to some material that easily decayed. I would assume bone, ivory, or horn is a good possibility. The length of the existing rivet puts the missing material at 3mm. I have not seen any parallels of this type of construction. The zig-zag wriggle-work decoration would put this at roughly the 13th/14th century. Of interesting construction note are the rivet holes which are conical instead of a straight sided. This would indicate a reamer or conical drill bit being used. There is no specific evidence that this was cast. It could just as easily be done from stock. The channel for the tongue is raised slightly above the rest of the buckle and it shows evidence of filing. The back of the buckle is irregular and shows coarse file marks. There is no place to attach a buckle plate or strap. The decoration goes all the way to the tongue pivot, leaving no obvious place for attachment. 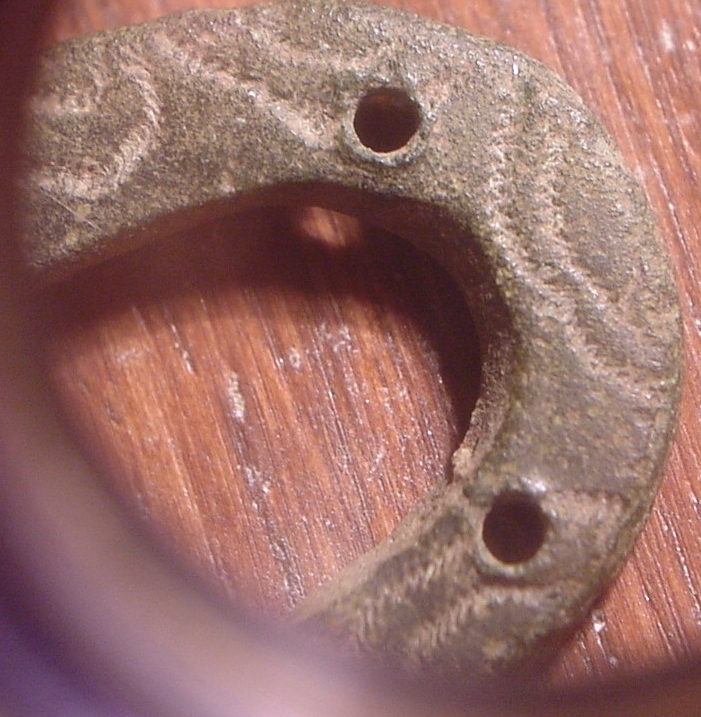 It is probable then that whatever substrate this was attached to served as the buckle plate. If you know anything about this buckle or have seen a reference to one, please let me know. Close shot of the wriggle work. This is done by rocking a chisel-like graver back and fourth in a zig-zag pattern. Here is a possible reconstruction showing the piece as a reinforcing ring on an ivory or bone buckle plate.